What could I possibly do for lunch on a damp winter’s day? Soup springs to mind. But I am, first and foremost, a carnivore. If I am to have soup, it must have some sort of meat involved. Rooting around in the fridge revealed a day old chicken thigh, half a red onion, some wilting celery, an Ossawa pork and pistachio sausage, a little country ham, a half carton of College Inn’s chicken broth, and a brick of stale boule. Adding in some garlic, a splash of marinara sauce, a dash of hot sauce and a palmful of rice and I had a very filling and very warming soup. To lighten it up some, eliminate either the bread or the rice. Some assembly required: heat some olive oil and a spoonful of butter in a sauce pan. 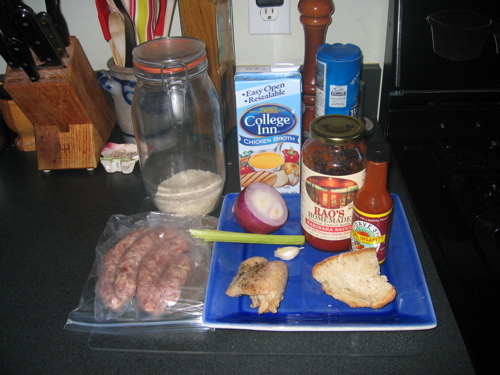 Add in all ingredients except the broth, bread, hot sauce and marinara sauce. Once the onions are wilted and the sausage begins to brown, chuck in the marinara sauce and stir everything around. Add the broth, hot sauce and toss in the rice and bread. Simmer over low heat for 20 or 30 minutes. Salt and pepper to taste. This entry was posted in Living and tagged soup recipes. Bookmark the permalink. That sounds soooooooo good! I’m going to try it – or something, more likely, inspired by it! bevglen, glad you think so! Be sure and post a tweak or whole new recipe inspired by this one. I’ll be more than happy to try it!